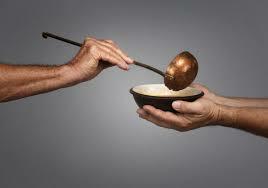 The call of the Christian is to care for those in need--a tangible way to serve the Lord. We are blessed when we feed the hungry and provide water to those who are thirsty; when we welcome strangers and refugees; and when we clothe the naked, take care of the sick, and visit those in prison. Because as we serve those people, we encounter Jesus in them. Not only should we continually pray for people who are suffering, but we should show practical support and care as well. Tearfund, an international humanitarian and development agency, works tirelessly around the world to help communities realize their own potential and lift themselves out of poverty, escaping the most dire of circumstances, and giving people around the globe a reason to practice Thanksgiving everyday. This Thanksgiving, why not practice gratitude by extending your compassion to someone who needs. Dear Lord, open our eyes so that we can see those around us that we can bless with a meal. In the Name of Jesus, Amen.